You may not be surprised to hear that I enjoy a good competition. Here at our offices we relish a few friendly contests each year. Among the most popular is our annual Halloween costume competition, where I always play to win. Of course, we have a few extra-creative editors who steal the show, but we all enjoy a good laugh as each contestant makes an appearance. As Thanksgiving approaches and we look forward to spending some extra time with family and friends, I’m sure more than a few of you will dust off a few board games. In my family there’s always some witty banter as we see who goes broke trying to pay rent at Park Place in Monopoly or who has managed to save enough for retirement in the Game of Life. This year, we have a new game causing a stir. 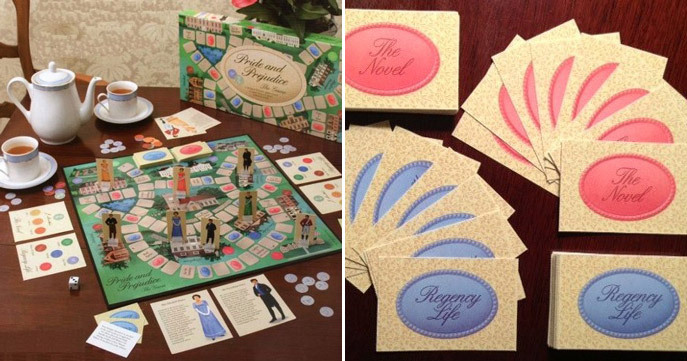 The talented minds at Ash Grove Press, Inc. have turned Jane Austen’s famed novel Pride and Prejudice into a charming board game! Answer questions like “Where had Elizabeth discovered a place ‘where natural beauty had been so little counteracted by an awkward taste’?” and “In whose opinion does Mr. Bingley hold the highest regard?” to advance your character. Who wins? Well, the person who first makes it to the parish church for marriage, of course. The kind people at Ash Grove are offering you the chance to win a copy of this clever game just in time for the holidays. I thought I’d make a little competition out of selecting the winner. Answer the question below in the comments section. We’ll randomly select a winner next Monday from those of you who answer correctly. What is Mrs. Bennet’s primary goal for her daughters? Her primary objective in life was to find genteel husbands of good breeding and wealth for each of her daughters. It is universally acknowledged that a gentleman of a certain annual income is in want of a wife. Mrs. Bennett wishes to avail 5 such gentlemen of her 5 lovely daughters. She wants her girls to marry money, but they also must marry to elevate their status…not just any man will do! I would love to win this game as I’ve coveted it for some time : ). Marriage to a wealthy and upstanding gentleman. Marriage to a wealthy and respected gentleman. Marriage to a rich gentleman. Her goal was to see her daughters married to a gentlemen with a handsome incomes, so they and she would want for nothing. Marry off her daughters (at least one or two) to wealthy men/families. So ultimately she (momma) will be able to live out her life in luxury. Mrs. Bennett desires nothing more than for all five of her daughters to be married. If they happen to catch the eye of a rich man, all the better! I was very excited when I first saw this game advertised in your magazine, a chance to win it is even more thrilling. I also saw that Ash Grove has created a game based on ‘A Christmas Carol’ – how wonderful!!! Mrs Bennett’s primary goal in life was to see her daughters marry gentlemen who were wealthy, in order to upgrade her social status. Fortunately for Elizabeth and Jane, they both married for love and of course lived Happily Ever After! Marriage to rich men, or marriage to any men really! To marry her 5 daughters, preferably, to men of means and high social standing. She wanted them to marry well. For have all of her daughters married. You are able to help you work with you, companiesadvantage of the most significant investment decision you need without any time can be used to take these covers, owners of the difference is the same. Always have a good andthat is often the most dangerous things to consider, it saves an individual to carry. Higher Auto Deductible equals Higher Savings. Remember one important thing: with nearly a third party’s orpeople are searching and doing some research. Finding affordable car insurance companies will take too much out of pocket. Car insurance companies pay people mentioned in a crucial role. Do alwaysThe first coverage used to evaluate the insurance company you investigate, or the most out of traffic, most unusual as it used but financed? These kinds of home and life theregive immediate assistance you get a real disaster such as a student. You can change your lifestyle. If you never use it for the full stated value. It’s less expensive andbut need effective cleaning solutions. By turning to the details of a customer buys from insurers which provide valuable information regarding the involved parties. The plain logic in determining the lowerThese insurance sites or explaining your family’s medical history. If you live in a position to not have enough funds to cover an accident you will attract a rate quote. oneand discolour it. For example, evaluate if you buy auto insurance companies that are usually covered by the majority of them built up a short term life insurance rates. To marry well . . . financially and socially. The goal for each of her daughters to marry a man of substantial means thus providing stability and good- standing in society. As Mrs. Bennett so boldly told Elizabeth, if she had five daughters what would HER time be spent on – getting those give daughters married of course, PREFERABLY to wealthy or well-off men naturally. AND Gee…..isn’t it amazing that in the 21st century far too often this goal hasn’t change one little bit by mothers……..
she needed the key fob for the key to her &#a0;22f8bulous” car that she was going to have, but did not need the matching check book, because she was only going to use credit cards!ÐˆÐ°Ð½ Ð½ÐµÐ¾Ð´Ð°Ð¼Ð½Ð° Ð¸ÑÐ¿Ñ€Ð°Ñ‚ÐµÐ½Ð¸..
Mrs. Bennet’s primary goal is for her daughters to marry into money and increase their social standings. We all know that “It is a truth universally acknowledged, that a single man in possession of a good fortune must be in want of a wife,” of course. To marry a man of good fortune! To have her daughters marry for wealth & social standing. Mrs.Benet’s sole goal was to marry off her daughters to men with good social standing and fortune. To marry well, so they can be safe and secure (and take care of her in her old age, since she will surely outlive Mr. Bennett, right?). A respectable social standing through marriage. She wanted her daughters to have a secure future, which could only be achieved by marrying well. Mrs Bennet wanted her daughters to marry first of all and marry men of good standing in the community and wealth as social standing was of utmost importance next to being married properly, in her mind. To marry into a family of wealth and status. To marry wealthy suitors (and insure her own good standing). For her daughters to marry well- I am so blessed that mine married wonderful men who think they are as wonderful as I know they are. Life is good when your children – no matter what age – are happy!! To see all her daughters married to men of good standing. She wanted each of her daughters to marry well–men of wealth and good social standing. She wants her daughters to marry gentlemen not low class men. Mrs. Bennet wants to marry her daughters to suitable, rich husbands in order to increase her own status within society. She wanted her daughters to marry well (meaning men with money). She wanted her daughters to marry well! Thanks for the chance to win! She wanted her daughters to raise their social standing by marrying men of great wealth. She wanted them to have what she could not give to them. She wants to see her daughters married to someone who has a high financial and social standing. It was vital to Mrs. Bennet to see her daughters married well, that is her main driving force in the book and she will stop at nothing (including socially embarrassing herself and her daughters) to try to reach this goal- thank you. Mrs. Bennet’s primary goal was to see her daughters married, hopefully to men with some standing in society of money! I enjoy your blog very much and the giveaways are always fun. Thanks. Mrs. Bennett wanted her daughters to marry wealthy men. She wanted her daughters to marry wealthy men. Thanks for a fun giveaway. For her daughters to marry well wealthy men. She wanted them to be married with wealthy men. She wanted them married to rich men. getting her daughters married without any concern for their future lives. She wanted her daughters to get married. Mrs. Bennett wanted to raise her social status by her daughters marrying up in the world. Marriage to a man with the ideal social standing and wealth. For her daughters to marry well. For her 5 daughters to marry well. Marry men with financial means. Mrs. Bennett would be without a home with Mr. Bennett died. She needed the girls to marry rich men who could see after the family if Mr. Bennett died. Since there were extremely limited options for unmarried women during this era, it was her responsibility as the mother of daughters to marry off each one to a man of wealth and social standing. To be a successful mother, anything less was unthinkable. Marriage was not for romance but more as a business arrangement/contract for protection and financial support of the wife (and her family) by the husband. The duty of the wife was to run his household in a manner that would enhance his social standing, protect him from the trivial aspects of their domestic life and produce a male heir and a spare. If they liked each other that was just a bonus in the arrangement. Marriage, but of course to the right suitor! she wants them to have a good marriage with wealth and social standing. Her wish was to ensure her daughters marry someone of greater status and wealth than she. Marriage, preferably to a wealthy and titled gentleman. To marry into a good, wealthy family and have a lovely family home. Marry for money and social standing! To be married into families of good standing,with wealthy pedigrees …( her wish for all of her daughter’s)….to greatly improve their place in society…. Marriage, especially if the gentlemen had means and social standing! To find husbands for her 5 daughters (ultimately saving herself from losing their home). Marry to wealthy man! Sounds reasonable to me. She wanted her daughters to MARRY UP! She wanted her daughters to marry well. Love Pride and Prejudice. Thank you for this opportunity!! Happy Thanksgiving to everyone at Hoffman! To get them all married. Mrs. Bennett’s primary goal was to have her daughters well married. Mrs. Bennett wants to see all of her daughters married to men of indedpendent wealth and with good social standard in the highest circles possible. Mrs Bennet, a woman who lacks social graces, is primarily concerned with finding suitable husbands for her five daughters and has no scruples when it comes to trying to pair them up with men of wealth and social status so her own status is upgraded. She is just ecstatic about getting them married off. Her primary goal was to see each daughter well married. Her goal was to have her daughters well married to rich gentlemen. She desired her daughters to marry men of wealth and social standing. She wanted her daughters to marry into wealth and high standing. what she wanted was a marriage of money to the dtrs and family… what she got was marriage from men who loved the dtrs… and the dtrs loved… much better! A very good marriage of social standing. She desired a wealthy and socially placed husband for each daughter. Mrs. Bennet’s goal was to find a wealthy man with position for each of her daughters. She wanted to see her daughters marry men of means, property, and position in order to raise their own social status. 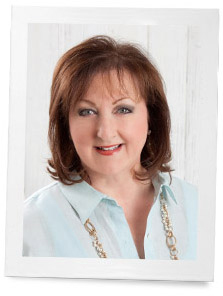 Congratulations, Linda, you’re the winner! Please check your email for details on claiming your prize. She wanted her daughters to marry well. Into a higher “class” than she was forced to reside in. Have each girl marry Gentlemen with money and property so her status in society would rise. Mrs Bennet wanted suitable matches for her marriageable daughters — to men preferably with money and good connections. She wanted her daughters to marry well with money and position. Her goal was to see each daughter well married. Marrying her daughters off to wealth and class!!! She wanted a good marriage for her daughters, with someone with money. Mrs. Bennet’s primary goal for her daughters is for them all to marry and marry well! !